Mundford will be known, if it is known at all, for the dull expanse of 1960s housing at the point where the way to Swaffham branches off of the Thetford to Kings Lynn road. But behind this modern facade it is a lovely village, with a terrific old pub on its little market square. The church is an odd looking thing. South-west towers are common enough in East Anglia - there are about fifty of them in the two counties of Norfolk and Suffolk - but this one doesn't look quite right. This is because its Norman-style stages and broach spire are a Victorian confection, built to replace a west tower that had fallen a century earlier. Oddly, the main entrance to the church is on the north side. The space beneath the tower appears to be used for storage; there is a vestry on the north side of the chancel. The refurbishment was at the expense of the local lady of the manor, Mrs Lynne-Stephens of Lynford Hall. She also bankrolled the fabulously expensive Our Lady and the English Martyrs Catholic church in central Cambridge, one of the biggest churches to be built in England in the 19th century. As a Catholic, she had no reason to care for the upkeep of the local Anglican parish church, beyond a sense of responsibility and civic duty, for which amen. Pevsner, who is unusually disapproving of this building, argues that the tower top is French in style because Mrs Lynne-Stephens was a former French ballet dancer. Well, perhaps. But Mundford would be just another Victorianisation if it were not for what happened here in the early years of the 20th Century. You get the key from the Rectory, which is near at hand, and the Rector is a most affable old chap. He tells you that there has been an increase in visitors in the last year or so, 'because of that book', and this might remind you if you had forgotten that this was one of the three smaller East Anglian churches given a makeover by Ninian Comper in the years before the First World War, and that a recent guide book to Comper's work has been published. Along with Great Ryburgh and Lound, Mundford church received the full Comper treatment. It is perhaps not as well known as the other two, even despite the book, but in some ways this is the most interesting one of the three. You enter the tunnel-like nave, still all of its dull 1880s restoration, but it is once you reach the rood screen that things get interesting. From here eastwards everything is Comper's, and it is the most complete scheme of his work in Norfolk. And yet, if you have recently visited the joyful, bubbly screen at his Lound, as I had the day before, there is something rather austere and oppressive about this screen, partly because of the great organ case on top of it, but also because it was never gilded. It appears rather out of scale, as if it was intended by Laudians for a much larger Oxbridge college chapel, but washed up here instead. Pevsner thought it was quite extraordinary, the coving on both sides making it seem much larger than it actually is. 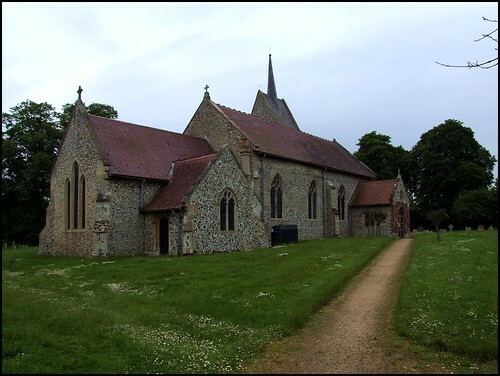 It dominates the church as its main feature in a most un-East Anglian, un-medieval way. It is something of a relief to step through into a chancel which is all Comper's. The furnishings (Remarkably out of place in this modest chancel - Pevsner) are Comper's best in East Anglia, and the alabaster reredos is a near-identical twin to the contemporary work at Great Ryburgh, although in much less good condition. The glass above (terrible - Pevsner) depicts St Mary Magdalene and St Stephen flanking the risen Christ. Incidentally, Pevsner says that the reredos and glass seem to be by Comper too, but how he could ever have doubted this is beyond me, especially as the window is signed by Comper with his strawberry leaf symbol. Panes at the bottom depict the martyrdom of Stephen, and an inscription remembers the Lynne-Stephens family. Curiously, the Comper restoration was paid for by Captain Montagu of the Hall, a single-minded Anglican who was so appalled by the Catholic chapel that the Lynne-Stephens family had built in the grounds of Lynford Hall forty years earlier that he planted a screen of trees around it, which to this day make it difficult to photograph. Comper's chancel is completed by the fabulous roof, painted at his direction, but with echoes of Pugin's work at West Tofts a couple of miles off from half a century earlier. This seems to have been an enthusiastic area for Anglo-Catholicism in the late 19th Century. As well as West Tofts we are close to George Street's excellent East Wretham. You can't help but wonder what Comper and the other early 20th Century militants would have made of the Anglican church's recent declaration that women can be Bishops. I dare say that they simply wouldn't have believed that such a decision was possible. Chatting afterwards to the Rector, and trying to persuade him that, given 'that book', it might be a good idea if the church was opened every day, he mentioned in passing that Mundford is close to where three dioceses meet. To the south is St Edmundsbury and Ipswich, while Ely starts just the other side of Cranwich on the outskirts of the village. Mundford is in the same diocese as the remote ports fifty miles away on the coast, but is cut off from the majority of the Norwich diocese by the vast, forbidden battle training area, which lies just to the east of Mundford. This must give the parish a pleasing sense of isolation at times, although the Rector, not unreasonably, was planning to retire to the coast after he finishes here.